Ahh. I’m loving this game. I legit only played about 35 minutes for the PS3 version a few years back. Seems to be a pattern with me the past few years: not playing games for long periods of time or giving them any real play-through. 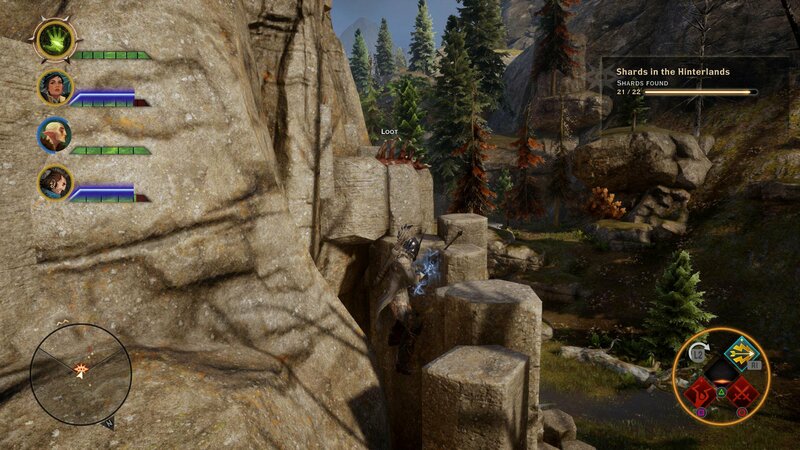 Dragon Age: Inquisition is an action role playing game with pause-able fighting via the tactical mode. It’s like a hybrid between full real-time action RPGs (like the Diablo series) and turn-based, tactical RPGs. I like it. For a four-year-old game, the graphics of Dragon Age: Inquisition are still beautiful compared to contemporary games. Some chopping-off of limbs and faulty object detection here and there, but nothing that takes away from the gameplay. Actually, the glitchy detection has been useful — as well as a hindrance — when attempting to reach certain areas. Like the (final) shard (in my case) atop the column spiral staircase thingy in the Hinterlands located in Lady Shayna’s Valley — the first possible dragon battle. Gotta start by jumping here. Keep pressing jump, jump, jump. Might have to get a bit of a “run” on that small column to reach. Just keep at it. Say you make it up here, with the final shard and awesome loot, which consists of various dragon-related items, you might end up falling in-between the rocks — like i am doing here — and need a way out that’s not re-loading a save. Just go into tactical mode then back to real-time. That seems to fix other glitches throughout. Crafting and looting systems are integrated seamlessly, without bogging you down with endless reading and searching the codex before being able to craft or augment useful armor and potions. I actually didn’t get into the potion creation and upgrades or the armor and weapon creation until i was around level 8 or 9, about 30 hours in. Actually using upgraded potions and weapons has made my fights a little less stressful. Side missions are peppered throughout the main quests — again, seamlessly — allowing some downtime from narrative. Some of them don’t even seem like side quests, but they work complimentary with them, even with cut scenes. Quest leading the druffalo back to the farm. Quest leading the druffalo over the ravine back to the farm. Ahh! The first dragon battle opportunity. Using the collision detection glitches to my advantage while climbing the column spire to find the final shard in the Hinterlands. Found a Dalish bow in some loot. Looking forward to continuing with this — been dreaming about playing. I’m about 45 hours in, and that’s in about five days of playing!